Feb. 8, 2019 — Former Rep. John Dingell, the Michigan Democrat who holds the record as the longest-serving member of the U.S. House, died Thursday night in Michigan. He was 92. And while his name was not familiar to many, his impact on the nation, and on health care in particular, was immense. For more than 16 years Dingell led the powerful House Energy and Commerce Committee, which is responsible for overseeing the Medicare and Medicaid programs, the U.S. Public Health Service, the Food and Drug Administration and the National Institutes of Health. As a young legislator, he presided over the House during the vote to approve Medicare in 1965. 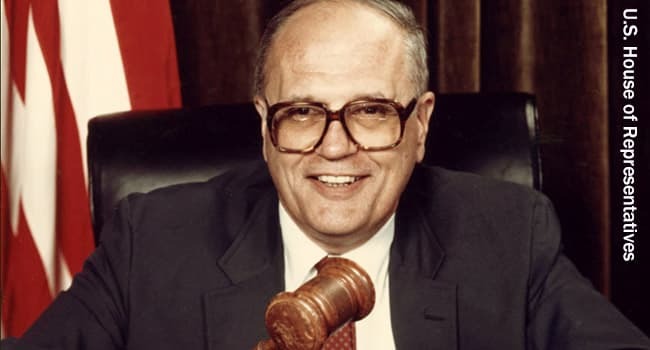 As a tribute to his father, who served before him and who introduced the first congressional legislation to establish national health insurance during the New Deal, Dingell introduced his own national health insurance bill at the start of every Congress. And when the House passed what would become the Affordable Care Act in 2009, leaders named the legislation after him. Dingell sat by the side of President Barack Obama when he signed the bill into law in 2010. He was not always nice. He had a quick temper and a ferocious demeanor when he was displeased, which was often. Witnesses who testified before him could feel his wrath, as could Republican opponents and even other committee Democrats. And he was fiercely protective of his committee’s territory. Dingell and his health subcommittee chairman, California Democrat Henry Waxman, fought endlessly over energy and environmental issues. The Los Angeles-based Waxman was one of the House’s most active environmentalists. Dingell represented the powerful auto industry in southeastern Michigan and opposed many efforts to require safety equipment and fuel and emission standards. In 2008, Waxman ousted Dingell from the chairmanship of the full committee. But the two were of the same mind on most health issues, and together during the 1980s and early 1990s they expanded the Medicaid program, reshaped Medicare and modernized the FDA, NIH and the Centers for Disease Control and Prevention. “It was always a relief for me to know that when he and I met with the Senate in conference, we were talking from the same page, believed in the same things, and we were going to fight together,” Waxman said in 2009. Dingell was succeeded in his seat by his wife, Rep. Debbie Dingell, herself a former auto industry lobbyist. ©2013-2018 Henry J. Kaiser Family Foundation. All rights reserved. Star Sightings: Lea Michele Kicks Off Bachelorette Weekend With Tropical Hawaiian Getaway & More! Kokoskov worked as an assistant with four NBA teams from 2008-18.